In the summer of 2011, labor unrest on both coasts provided a sharp rebuttal to the widely held view that the strike is dead (and buried) in America. Even as veterans of the Professional Air Traffic Controllers Organization (PATCO) gathered in Florida to commemorate the thirtieth anniversary of their historic defeat, a new generation of strikers was taking on big private-sector employers like Verizon and Kaiser Permanente. Last August, 45,000 Verizon workers walked out from Maine to Virginia in a high-profile struggle against contract concessions. One month later, they were joined by 20,000 nurses and other union members similarly opposed to pension and health care givebacks at Kaiser Permanente in California. Both of these struggles came right on the heels of last year’s biggest upsurge, the massive series of public employee demonstrations in Madison, Wisconsin that included strike activity by local high school teachers. Of course, in 2010, there were only eleven work stoppages, involving 1,000 workers or more, in the entire country. And the year before that, as PATCO historian Joe McCartin notes in Collision Course: Ronald Reagan, the Air Traffic Controllers, and the Strike that Changed America, the government reported only five major work stoppages involving a mere 13,000 workers in all—a tally roughly equal to the number of workers who walked off the job in a single, momentous strike on August 3, 1981. So, like the walkouts of 2011, these new books remind us what striking looks like, whether it fails or succeeds in a single union bargaining unit, or becomes part of a broader protest movement. A professor at Georgetown University, McCartin describes what happened when a tightly knit union brotherhood (there were only a few female air traffic controllers in 1981) assumed, mistakenly, that it was irreplaceable. President Ronald Reagan’s retaliatory firing of 11,345 PATCO members has cast a long shadow over collective bargaining in the United States, and has provided inspiration for the more recent union busting activities by Wisconsin governor Scott Walker and others. PATCO’s destruction ushered in a decade of lost strikes and lock outs, triggered by management demands for pay and benefit givebacks. Given renewed momentum by our latest recession, this concession bargaining trend continues unabated today, in both the private and public sector. Nevertheless, just twenty-five years after PATCO lost, hundreds of thousands of foreign-born workers participated in political strike activity on a scale rarely seen in the United States, even in the nineteenth and twentieth centuries. 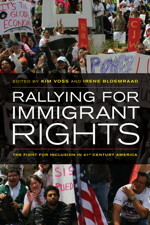 Their “rallying for immigrant rights,” as sociologists Kim Voss and Irene Bloemraad call it in their edited collection, took the form of successive one-day protests, culminating in a massive work stay-away on May 1, 2006. Both union members and an even larger number of non-union workers took to the streets in major cities across the country, along with their family members and community supporters, to protest Republican legislation that would have made it a federal crime to live in the United States illegally. Known as the Border Protection, Antiterrorism, and Illegal Immigration Control Act, this bill was adopted by the House but died in the Senate thanks, in large part, to the grassroots movement against it. If the labor movement is to rise again, it will not be as result of electing different politicians, the passage of legislation, or improved methods of union organizing. Rather, workers will need to rediscover the power of the strike. Not the ineffectual strike of today, where employees sit on picket lines waiting for scabs to take their jobs, but the type of strike capable of grinding industries to a halt—the kind employed in the first half of the twentieth century. As McCartin recounts in Collision Course, the groundwork for PATCO’s fight-to-the-death with the Federal Aviation Administration (FAA) was laid by changes in the system of federal employee labor relations in the early 1960s. After several false starts, the controllers were able to create a real union to replace an ineffectual, management-dominated professional association. PATCO’s emergence was part of “the largest surge in unionization since the emergence of industrial unions in the 1930s. By 1967, teachers, social workers, fire fighters, police officers, sanitation workers, and others were raising a cry for ‘trade union rights to public employees NOW!’” Like state, county, and municipal workers in many parts of the United States, air traffic controllers ended up with the ability to negotiate about some employment conditions, but without any legally sanctioned right to strike. Nine months earlier, PATCO had endorsed Ronald Reagan’s presidential candidacy, believing that he would be more controller-friendly than Democrat Jimmy Carter. PATCO strategists were “sure Reagan would not fire more than ten thousand skilled specialists that the government had spend hundreds of millions of dollars and many years to train—not when they were seeking only improved working conditions and fair compensation after years of seeing their salaries lag behind inflation, and when dismissing them would ultimately be far more costly than meeting their demands.” But, after giving them forty-eight hours to return, the former California governor (and one-time leader of the Screen Actors Guild) did dismiss the FAA employees who struck illegally at 400 airports and air traffic control centers. They were soon replaced by 800 military and 8,900 civilian controllers (supervisors, picket line crossers, and new hires), a cobbled-together workforce that cost taxpayers $2 billion to recruit, train, and deploy. Commercial aircraft continued to fly despite a post-strike FAA staffing shortage that persisted for years. The president of the Air Line Pilots Association (ALPA), also turned his back on PATCO, leaving other AFL-CIO Council members to conclude, privately, that the controllers’ walk out was a “no-win situation” created by “botched negotiations.” J.J. O’Donnell, then president of ALPA, publicly declared that the post-strike skies were safe. His own union’s safety committee disagreed and its findings, if backed by ALPA, could have been the basis for more individual pilots refusing to fly. In 1982, after being voted out of office, O’Donnell was named to a top Labor Department post by Reagan. In contrast, PATCO strikers remained under a lifetime presidential ban from federal employment as controllers until 1993, when the Clinton Administration finally allowed a small trickle of them to return to their old jobs. In April 1980, PATCO distributed a fifty-five page strike planning booklet to members. In the months that followed, the union prepared as though it was going to war. Strike planners developed ‘clusters’ of locals that could coordinate their activity during the anticipated strike, independent of national direction should PATCO’s leaders be arrested. Clusters had established secret ‘safe houses’ from which local strike efforts could be directed in the event that union headquarters were raided. Strike planners urged local clusters to set up decentralized calling trees to pass information and recommended that members use phone booths or friends phones when communicating vital strike information. But systematic internal preparation was not supplemented by prestrike outreach to other potential allies. In this regard, breaking ranks with the rest of organized labor in the 1980 presidential race was not the controllers’ only pre-strike mistake. PATCO members also failed to build cross-union ties with the pilots, mechanics, flight attendants, and baggage handlers whose backing was desperately needed when push came to shove. According to McCartin, the pilots in particular viewed the walk out as “a threat to their livelihoods” because of the thousands of furloughs it would produce. The Reagan administration, on the other hand, “knew that winning the cooperation of major airlines was essential” to withstanding the pressure of a strike in a period of rising fuel prices, deepening recession, excess capacity, and other “ongoing turbulence unleashed by the 1978 airline deregulation act.” The FAA’s strike contingency plan was sold to the Air Transport Association, the national trade group for carriers, as “a way for airlines to shed their least profitable routes without fear of aiding their competitors.” The ATA’s “staunch support was a crucial component of PATCO’s defeat,” McCartin concludes. PATCO’s subsequent bankruptcy and decertification, in turn, strengthened the hand of airline management in its own future showdowns with ALPA, the IAM, the Flight Attendants, and other unions at Continental Airlines, Eastern, TWA, and Northwest. Nevertheless, as court injunctions, $32 million in fines, and criminal indictments (against seventy-eight strike leaders) piled up around the country, the PATCO strike became a labor cause célèbre. As McCartin notes, “many activists were angry with their national leaders for failing to do more for PATCO.” At the local level, there was a tremendous outpouring of support for the strikers, despite media vilification of their contract demands as greedy, irrational, and “unpatriotic.” Viewed from the perspective of the last three decades—with its real-wage stagnation, longer working hours, and shrinking pensions—PATCO’s proposals do seem “unrealistic” today. But that is a sad commentary on how far union bargaining has gone in the wrong direction, and how worker expectations have been lowered in the process. Thirty-one-years ago, the stressful working conditions in air traffic control, that adversely affected FAA employees’ health and longevity on the job, led PATCO negotiators to seek a shorter work week (equal to the reduced hours of controllers in other countries) and better early-retirement benefits. Today, in many industries, early retirement is under assault, curbs on mandatory overtime have been weakened, and exhausting twelve-hour shifts have become the norm. Campaigns for reduced work time are few and far between, in the United States at least. At the FAA, modern-day controllers have been skirmishing with management about the problem of safety errors made as a result of sleep deprivation. Once again, they have union representation; in 1987, striker replacements and others hired, post-strike, formed the National Air Traffic Controllers Association (NATCA) and won a union certification ballot, even before Reagan left office. Lettuce, tomatoes and grapes went unpicked in fields in California and Arizona, which contribute more than half the nation’s produce, as scores of growers let workers take the day off. Truckers who move 70 percent of the goods in ports in Los Angeles and Long Beach, Calif. did not work. Meatpacking companies, including Tyson Foods and Cargill, closed plants in the Midwest and the West, employing more than 20,000 people, while the flower and produce markets in downtown Los Angeles stood largely and eerily empty. The editors, joined by political science professor Taeku Lee, describe how the defeat of Sensenbrenner’s bill in the Senate did not translate into further progress for advocates of immigrant rights, however. Groups pushing for more restrictive immigration policies simply shifted their focus from Congress to the states, first under George Bush and now under Barack Obama. In the wake of the protests, there were continuing workplace raids by Immigration and Customs Enforcement (ICE) agents. There was also a sharp increase in the number of deportations in 2007 and 2008. More undocumented workers rounded up by ICE were also charged with felony violations of identity theft and forgery laws. Now, under the not-much-kinder-or-gentler Obama Administration, the use of no-match letters has become the enforcement tactic of choice, triggering large-scale workplace purges by low-wage employers across the country. All of this has “had a chilling effect,” Voss, Bloemraad, and Lee argue. For their part, the two unions most supportive of the foreign-born—SEIU and UNITE HERE—fell out among themselves in 2009–10, moving from “strong internal disagreement” (about issues unrelated to immigration) to public feuding over national union funds, jurisdiction, and membership. As I recounted in The Civil Wars in U.S. Labor (see Jon Flanders’s review in Monthly Review, May 2011), this internecine conflict proved to be a costly distraction from grassroots campaigning for health care and labor law reform during Obama’s first two years in office; it was also no boon to immigration reform, a cause with almost as many political enemies as the Employee Free Choice Act. In his book, Burns praises the more freewheeling “social movement” character of the immigrant-worker upsurge six years ago and its middle-American counterpart in Wisconsin earlier this year. “Reviving solidarity requires new approaches to unionism based not on workers focusing on narrow battles with individual employers but, rather, on fighting for larger issues and causes,” Burns argues. He notes that, in France, “workers respond to attempts to eliminate social programs not through letter or email campaigns to politicians, but through direct action involving millions of workers,” struggles that look more like the “Day Without Immigrants” or the anti-Walker mobilization in Wisconsin than conventional union walk outs. One big obstacle to the latter, and a major reason that strike activity has shrunk statistically, is the legal straightjacket imposed on U.S. labor. As Burns documents well, the most effective strike tactics and forms of workplace solidarity have been effectively outlawed in the private sector, by legislative fiat and/or court decision. The high-water mark of labor efforts to restrict the debilitating use of permanent replacements in private sector strikes occurred nearly two decades ago during the Clinton Administration. Introduced in 1993 as the “Striker Replacement Act” (and later renamed the “Worker Fairness Act”), this legislation was quickly passed in the Democrat-controlled House, but blocked in the Senate by a Republican filibuster. When labor law reform was revived in 2007–10, in the form of the Employee Free Choice Act (EFCA), the continuing problem of striker replacements was not even addressed for fear of arousing even greater conservative opposition. Meanwhile, in government employment, only a small number of workers are permitted to strike legally. Public workers who ignore strike bans risk paying a heavy financial price, as PATCO members did thirty years ago and New York City transit workers did after their work stoppage in 2005 (for which they were heavily fined, individually and organizationally, and their union was stripped of its ability to collect dues via payroll check off). The recent attacks on public sector collective bargaining in the Midwest, where unions have been fairly well entrenched, has reframed the workers’ rights debate even more narrowly. Today, unions are fighting for the mere existence of contract negotiations and against bipartisan legislative attempts to limit the scope of bargaining with state, county, or municipal agencies. In mainstream union circles, strengthening the right of teachers or state workers to strike has become as unthinkable as repealing the Taft Hartley Act. Taft-Hartley’s restrictions on secondary strikes and boycotts — that would make primary walk outs more effective — are backed up by provisions that subject unions to employer damage suits and fines. For example, the United Mine Workers (UNW) racked up $64 million worth during its 1989 contract dispute at Pittston, which featured a rare plant occupation. The UMW contract campaign at Pittston is among those cited by Burns as a successful example of “membership mobilization and a refusal to play by the rules that favor management.” Using such case studies, and a mixture of historical and political arguments, Burns seeks to dispel what McCartin calls the “dispiriting psychological impact” that labor’s poor won-lost record, in major strikes, has had on members and leaders alike. Reviving the Strike is thus a provocative, well-argued, and much-needed polemic. Burns bravely takes fellow labor progressives to task for being too adaptive to the “new conservative reality” facing unions today. He chides proponents of “social unionism” whose organizing, bargaining, and coalition-building strategies have “functioned comfortably within the existing structures imposed by management and the legal system.” My only quibble with the author’s approach is a tendency to idealize some open-ended strikes or lock outs that settled into siege warfare and ultimately did not end well for the union side. Heroic struggles like the Hormel strike in the 1980s or the Staley lockout in the 1990s certainly raised worker consciousness, and even radicalized some participants. However, there is no getting around their tragic denouement, aided and abetted in both cases by national union hostility and treachery. Burn’s useful, if overly brief, discussion of “quickie” or intermittent strikes may be more persuasive and relevant to the situation of unions seeking to reduce the cost and risk of walking out, without abandoning that strategy altogether, as too many have done by not even maintaining adequate strike funds. A lawyer and negotiator for the Association of Flight Attendants (an affiliate of the Communications Workers of America), Burns describes how AFA members developed a contract campaign and selective strike plan called CHAOS (Creating Havoc Around Our System). This was a response to the failed full-scale airline worker walk outs of the 1980s and involved the threatened use of intermittent job actions directed at individual flights. While legally entangling in other ways, the Railway Labor Act that governs airline industry labor relations is less restrictive in this area so, “unlike in other industries, CHAOS can inflict major economic harm upon an employer” while minimizing flight attendant exposure to management retaliation. The fundamental lesson of all these books is as old as unions themselves: an injury to one is an injury to all. No labor movement can long survive, much less thrive, without a strong culture of mutual aid and protection, that facilitates, when necessary, the withdrawal of labor from the production of goods or providing of services. When labor organizations practice solidarity some of the time, rather than all of the time, they do a grave disservice to their own members. And they also contribute to the worsening of employment conditions for the working class majority which lacks even the limited job clout of the union-represented. Steve Early (lsupport@aol.com) is a longtime union activist and the author of Embedded With Organized Labor (Monthly Review Press, 2009) and The Civil Wars in U.S. Labor (Haymarket Books, 2011).